Although it's my second time in Coron, I wasn't fully focused on the places we went to when I first traveled here in 2009. I just tagged along with my friend because I had always been the kaladkarin type when the opportunity strikes. Although I am still one (hehe), what changed is my deep appreciation for the experiences thrown at me. I am more "living at the present" now. In a way, blogging helps in processing and remembering my trips more for future reference - or even just for memory's sake. But this time, I have a camera to capture all these! Read on! Coron is a municipality in Palawan, with islands separating the South China Sea from the Sulu Sea. Accessible from Busuanga's Francisco B. Reyes Airport, after our swift flight with Skyjet Airlines, we took a 30-minute shuttle ride from the airport to our hotel (The Funny Lion). My favorite part of our hotel: The spacious and clean, white hallways. Hi Kuya Melo! Ganda ng maleta! Coron is also the largest town in Busuanga, and is famous for its World War II wreck diving - the reason for my 2009 trip. The Aussie uncle of my friend flew here just to experience diving this world's famous, well-preserved underwater spot (even then). Aside from diving, Coron is also popular for its white sand beaches, lakes, and indigenous tribe. If you're heading to or planning a trip to Coron, you're making the right decision! I don't know where my friends got this, but they said that Coron is also the most beautiful island in the world! Fresh from the airport, we only had a few minutes to eat our "heavy snacks", check-in, and freshen up, before we're on the road again. It was rainy, so we decided to let-go of Mt. Tapyas (whew, haha). But since we still had a few hours left before bed-time, we maximized our first day by soaking in nature's therapeutic bath tub: The Maquinit Hot Spring. We left our things in one of the shared cottages, before heading for a dip. I was so excited to try this, I was a fan of the Japanese onsen. I also had vague memories of Laguna's crystal springs from old family reunions when I was a kid, which is technically the same thing as the Maquinit. I appreciate hot springs more now. I can't imagine if we went there during the day OR during summertime when our country is at its boiling point (haha), but I think our Maquinit experience is something that you will describe as the "right place at the right time". Everything's perfect - water is not too hot, the minor drizzle is comforting. Maquinit is a 30-minute ride from Coron's town proper, entrance is around Php 200. This site is one of the few SALTWATER hot springs in the world, with water heated by a volcano. There are two circular pools, with rock walls and tiny pebbled flooring. A tip though, make sure to hydrate after, felt a bit dizzy after sitting in the pool for almost an hour. Although view is best during the day, nighttime hot spring is also a pleasant experience. Our second day was also our only full day, and it was packed! Rain or shine, I was ready for anything! Ruth (my roommate) and I slept at around 1am already the night before (chikahan galore! ), but we were still the first ones up! I think we opened The Funny Lion's breakfast buffet at 6:30am, haha! "But first, coffee!" The Funny Lion serves Tagbanua Coffee in the resort, supporting Coron's tribe and local products. I love breakfasts at the The Funny Lion. The resort serves variety of foods, buffet style, and they're good! Sabi nga ni Ruth, minsan so-so lang ang food sa mga resorts. But here, I will say that they're all delicious! Kuya Rick of Expeditions EcoTours was our main guy for the trip. To me, the guides are always the make-or-break of any tour, but Kuya Rick and Expeditions are both highly recommended. They made everything fun, educational, and a bit easier for everyone. I was clueless at that time, but reading up now, I learned that what our group had was Expedition's Coron Island EcoTours - A whole day island getaway that includes van transfers, exclusive tourist boat, individual life vests and snorkel with goggles, first aid kit, freshly cooked lunch, entrance fees, and a tour guide. More on that and Expedition's other tours HERE. The group boarded our private boat early in the morning. Everyone's energetic, the rain did not ruined the mood (which I like). Eventually I realized I was lucky to be with a group that's so full of life and appreciation. We were laughing the whole time, trying out new things, and I even learned a thing or two from the vloggers' admirable work ethics! Paul, trying to catch a Pokemon during our boat ride, wahaha! First stop was to snorkel at the Siete Pecados Marine Park. According to an ancient folklore, or so the internet says, the name Siete Pecados came from the seven siblings who went swimming without asking for their parent's consent. They never got back home, but seven islets showed up in the site where they were last seen. Kind of spooky reading this now, mabuti nalang tapos na ang trip! Haha! First in! I always say that I prefer the cold and the city from the beach, but I can't deny my water baby heart. I love water sports and swimming! One of my new friends from this trip, McPol. This guy is hilarious! I love Siete Pecados. 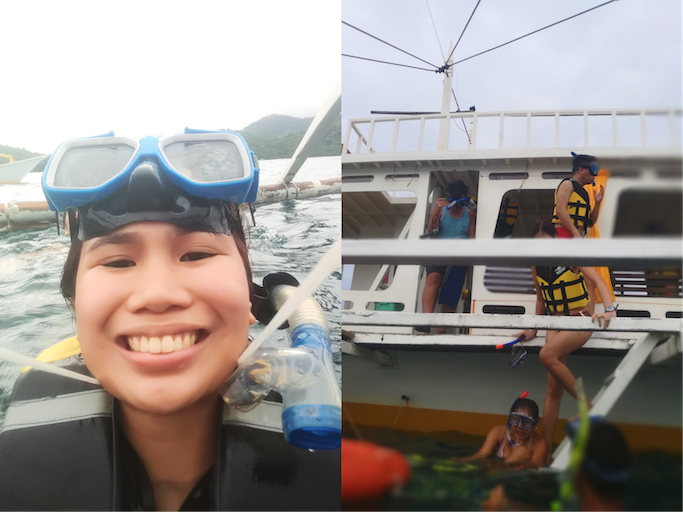 We got there and it was just drizzling so the place felt nice and cool, and Kuya Rick allowed us to just swim around the vicinity while watching the HD fishes, corals, and marine life through our goggles. Ang ganda! At times like this, I really regret not having an underwater camera! If I remembered anything from my 2009 Coron trip, it's this! The Kayangan Lake is Coron's most popular AND most photographed attraction! Then we trekked further. I think what made the hike easier this time was partly because of the hilarious people I was with. There was a time when a group we came across recognized Wil and screamed (imagine two-lanes lang kami so rinig na rinig sya!) "OW MY GOD! IS THAT WIL DASOVICH!? I WATCH YOUR VLOG!" Then Wil replied with "YOU'RE IN THE VLOG!" while pointing his camera to the girl. Natawa ako because it sounded so game show / It's Showtime -ish, we tirelessly repeated the lines with Valley Girl accent, laughing like hyenas as we entered the Kayangan Lake. When we got there, people were already floating in the lake, so I joined them. The good vibes blog group: Justin, Wil (on the background! ), Kuya Melo, and Ruth. This was after Ruth's boo-boo with the planks, where one of her leg went through! May souvenir agad! Photo op on our way back, thanks to Paul! Parang copy-paste lang ako dito, haha! Tired from the swimming and snorkelling, our boat stopped over in the middle of a secret lagoon, while Kuya Rick's team set-up our beautiful lunch! Usually daw, they hold lunches at the Calachuchi Beach, but because they saw na ang daming tourists that day, and it was raining, we went for this finer alternative. I actually liked it! Imagine, solo namin the area, the view is so divine, while we devoured on the fresh lunch cooked especially for us. I had my own "tip of the boat" moment after eating, hehe! Justin, McPol, and Cha jumped from the boat after our feast! My pinaka pinaka favorite from this tour! In order to access the Hidden Lagoon, you have to either climb a wooden stairwell, or swim underneath a narrow hole that usually can only be done during low tide. The rocks underneath are also sharp and scary. It was high tide when we were there, so I did not think twice and just climbed up the stairs. Once you get on the other side, you'll realize why you're in Coron in the first place. The lagoon is quiet and serene, walled by towering green mountains that echoed our laughters. We were lucky, we were the only ones there! It was one of those "We are infinite" moments! Meanwhile, water is dark and bottomless, a mysterious combination of icy cold on the surface, and hot as you get in further -- The meeting of salt water and fresh water. I super love it! I floated aimlessly, without a care! In Barangay Lajala dwells Coron's Tagbanua Tribe, one of the oldest ethnic groups in the country. They are said to be descendants of the Tabon Man, making the Tagbanuas the original inhabitants of the Philippines. It started to rain again when we were walking to our destination. We ran to save our cameras and other gadgets, till we stopped over one of the houses where Nanay Maurit lives. Our agenda there was to watch and learn how to make the delicious Tagbanua Coffee! Nanay Maurit is very warm and funny, naturuan pa sya ni Wil mag "Pak Ganern!" hahaha! Meanwhile, Cha and I decided to walk around the area, where she told me about the solar panels and the popular French vlogger who initiated this project. Sayang he was in Manila when we were there! It was getting dark, so we just packed the coffee and brought it to the hotel. Group photo before heading back! Thank you Nanay Maurit for welcoming us to your home. A day or two is not enough, but still, the trip was as memorable and inspiring as I wished it to be! If you're now convinced to visit Coron one of these days, here's a place that I personally recommend for your accommodation. The Funny Lion is a luxury boutique hotel in Coron, perfectly located just 30 minutes from the airport, and 30 minutes to the port for the tours. The facilities are modern and complete - they have a pool, a view deck with jacuzzi and bar, a spa, and their own restaurant that serves buffet breakfast, and ala carte for the other meals. Since there is no walking distance commercial area from the resort, it's good that they have everything that the guests will need! The only downside is the unstable wifi, which is understandable because we're in an island! For the rooms, they have the King Room, the Cub Room, and the Pride Room. Maximum occupancy for all three rooms is 2 Adults + 2 Children or 3 Adults, differing in types of bed. Two twin-sized beds, one of them with a pull-out bed (mine). Had nice sleeps here, and nightly chikahan with Ruth! Complimentary water is refilled in a nice glass jar to be more environment friendly; basic toiletries are provided (toothbrush, soap, etc). Even their shampoo and body wash are proud-local, I miss the lemongrass scent! Ahhh... I miss our room! If you're looking for a comfortable place to sleep after all the nature trekking and swimming, book The Funny Lion. I learned that they are proudly the NUMBER 1 accommodation in Coron recommended by TripAdvisor, no less! Ending this post with a shout-out to all the bloggers and vloggers (Paul, Ruth, Anj, McPol, Cha, Wil, Justin), and our hosts for this trip: Kuya Melo, Ms. Cheena, Noodle, and Ms. Kata! I can't stress this enough: but this trip is just filled with inspiration, positive vibes, and enthusiasm, even an introvert like me was caught laughing mad during our hike! Miss you guys! :) Watch out for their own blog and vlog entries!!! Love the pics! I've been to Coron once and oh boy the place is like a Paradise. I highly recommend the place to my friends back home.